It’s Sunday morning and I’m just now doing the Saturday night fun that Randy suggests. Participating will not only help us remember our second great grandmother but will help us better understand what the Ahnentafel is as well as how to use our genealogy software. There’s actually a lot of skills and memory involved in this seemingly simple ‘Saturday night fun’ especially if you are new to genealogy. I’d like to say that I can recite all 8 sets of my great-grandparents but I can’t. So, I had to look it up but luckily I am quite adept with my genealogy software, The Master Genealogist. About 1860 in New York Orcelia married James B. Rury. They had 2 sons born in Broome Co, NY: Othello Pomeroy and James Lyman (from whom I descend). Her husband died in 1865 in a Civil War camp in East Worcester, NY from typhoid fever. Orcelia and James’ second son, James, was born on Christmas Day 1865. After her husband’s death Orcelia and her sons lived with James’ brother, Frederick, in Binghamton, NY. In approximately 1870 Orcelia married Lester Marks probably in New York. They had 2 sons born in New York then 1 son and 1 daughter born in Kansas. Died Dec. 5th, 1913, Mrs. Orcelia Jane Marks, …some five months previous to her death deceased had stroke of paralysis from which she never fully recovered but kept growing weaker to the end. She was a member of the Rebekahs, who conducted the funeral service at the residence on North Main St., and at night the casket was taken to the depot and shipped to Blackwell, Okla., on the midnight train for burial, accompanied by her husband and son, Ford. Mrs. Marks was a kind, Christian woman and had many friends in this vicinity who deeply miss her. The family of deceased extend to the many friends who so kindly assisted them in their hour of distress, their heartfelt thanks. Randy reminds us that our second great grandmother contributed about 6.67% to our DNA to make us who and what we are today. For me, Orcelia and I do not share any DNA because my father was adopted. Family isn’t only biological it is connection by love, experience, culture and much, much more. I know that Orcelia was a widow at the age of 23 and was a single mother for at least 5 years, earning money as a boarding housekeeper. My grandmother recalled that her father used to take her and her sister Jessie; one on each knee and rock and sing to them. She remembers him singing: ‘I had a little Sweetheart a long time ago And where my little Sweetheart is – I don’t know. She went off and left me, Left me all alone And where my little Sweetheart is I don’t know!’ also ‘Hear dem golden bells ringing out the glory of the land.’ I envision that my great grandfather was repeating the loving treatment he received from his mother, Orcelia. Hearing these stories again only strengthens my knowledge that my second great grandmother had a strong contribution in the handed-down parenting skills that I received and that I give my children. Update: I’ve been transcribing a video I have of my Grandma talking about her family. 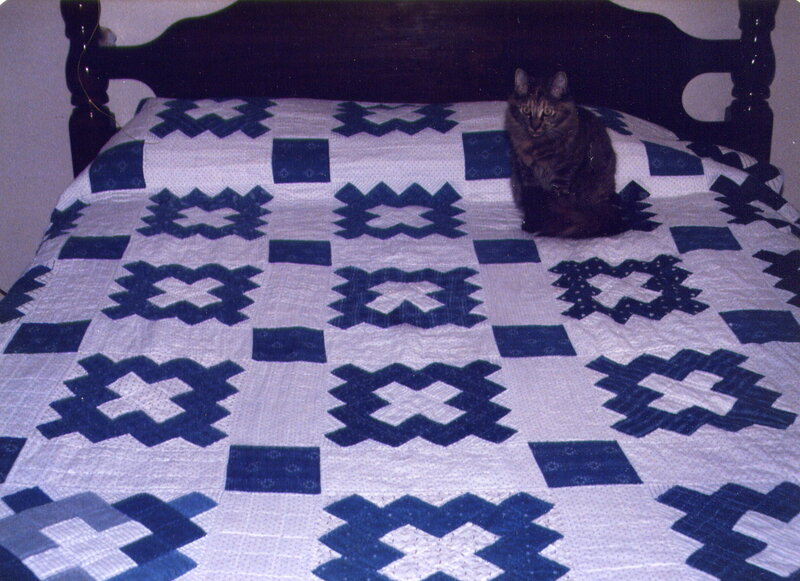 I had not been aware until today that a very old quilt that I have was pieced together by Orcelia. I was under the mistaken impression that my great grandma Maude Rury pieced it together but it was my great, great grandmother Orcelia Marks. She pieced it together using work shirts that were James Lyman Rury’s, her son. Years later my Grandma Ottie Brown finished it and gave it to me. Grandma Brown estimated that it was pieced together in the early 1900’s. Here is a photo I took of it near the time I acquired it in the mid 1980’s. What a wonderful post to start the day with. Thank you for sharing this. So many of our ancestors’ lives were hard, and your story reminded me that parents are not always biological. You have to wonder what went through the mind of your great-grandfather as he recited those lines to your grandmother. How wonderful to clarify the origin of the quilt. What cat is on the bed (it’s a little too dark to determine)? The cat’s name was Tigger. I got her at the pound when she was a kitten, her Mom was Siamese. What a great story, and a great find on the quilt. Looks like both of our #21s had some hard times in the Civil War. Orcelia Wright was my 2nd Great Grandmother via her marriage with Lester Marks. My Great Grandmother was Avis Mae Marks who married James Nelson Mayfield. Would love to read the transcript from the video of Orcelia. I too heard the Orville/Wilbur Wright relation but have not traced through the Wrights yet enough to track it down. I actually found a photo of Lester the other day in my grandmother’s (Bessie Mae Mayfield) things. I have scanned it, so let me know if you would like me to e-mail it to you. Brad, It’s great to meet you. I’ve sent you an email with some information. I have no photos of Orcelia or Lester and would love to learn more about them and acquire a photo.